Our research found that transit investment frequently changes the surrounding neighborhood. While patterns of neighborhood change vary, the most predominant pattern is one in which housing becomes more expensive, neighborhood residents become wealthier and vehicle ownership becomes more common. And in some of the newly transit-rich neighborhoods, the research reveals how a new transit station can set in motion a cycle of unintended consequences in which core transit users—such as renters and low income households—are priced out in favor of higher-income, car-owning residents who are less likely to use public transit for commuting. That’s a provocative paragraph, of course, and if you read more of the summary by the Center you’ll also find plenty of caveats that new transit lines often don’t automatically lead to gentrification or profound neighborhood change. The study also suggests some policy tools to help ensure the transit dependent aren’t squeezed out of their neighborhoods by, well, transit. 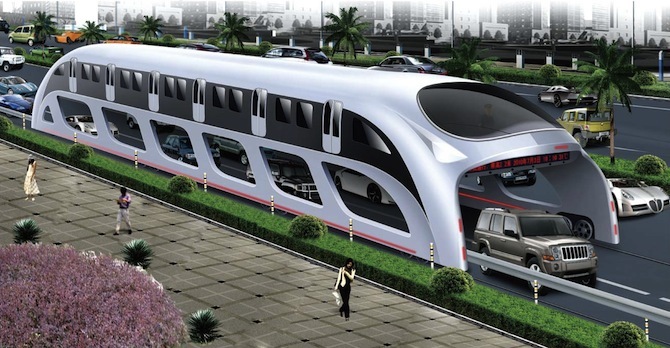 A Chinese firm that wants to manufacture a bus that runs on rails and straddles two lanes of traffic is setting its sights on marketing the vehicle in the U.S. They say it’s cheaper than a subway. My two cents: motorists who have always wanted to have their vehicles vacuumed up by a flying saucer will love it. Officials say that next year 1,000 bikes will be available at rental stations along the Caltrain corridor on the San Francisco Peninsula. The hope is that commuters will use the bikes for short trips near the rail stations. Cycling activists hope the program will get more people out of their cars but also note that better bike lanes and routes will also be needed. The blogger points out that transit data is still scattered across the world, in many different formats and with many different attitudes toward opening it to the public. In the meantime, private companies are building services that build transit data but it’s often impossible to pull the underlying data out.